I do not have a yarn stash. I have a collection. At least, that’s how I justify continuing to buy more yarn despite currently having more than I know what to do with. It can just be so hard to say no to some of the gorgeous yarns out there, especially the offerings from the independent dyers. At the same time, the indie dyers’ sites can be so overwhelming–there’s so much, and it’s so beautiful, that it can be hard just to buy a few skeins and move on without bankrupting myself. The colors were as gorgeous as I expected. The merino wool was wonderfully soft. And the yarn was bulky weight. That last surprised me because while I pay a lot of attention to the colors, I usually don’t look at the yarn base. Now I was just a bit stumped. 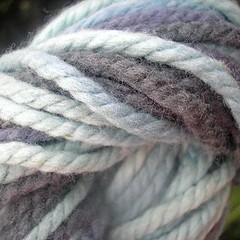 I’ve never worked with a bulky weight yarn before, and I wasn’t sure what to make with my 3 skeins. 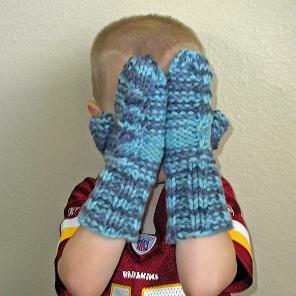 It looked and felt like it was going to knit up wonderfully warm…but warm isn’t a requirement here in south Texas. I resigned myself to putting it away until we moved to cooler climes. But the yarn was too wonderful to tuck away and forget, and my mind kept turning over possibilities. Then I remembered: we’re going to be visiting my parents in Pennsylvania for Christmas…and a white Christmas is always a possibility. Jeffrey and Lexie are certainly going to need warm hats and mittens. 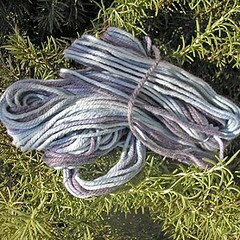 I could always buy some…or I could make some beautiful ones with my new yarn! 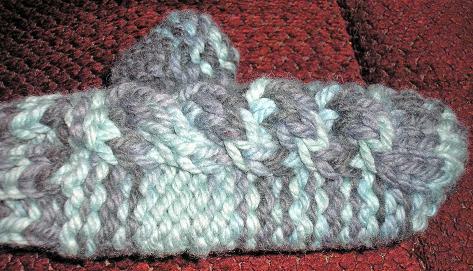 I knew a simple pattern would be best with the variegation and chunkiness of the yarn, but I also knew that, like with Jeffrey’s Slipstitch Wristers, I wanted some texture. I decided one large cable down the back of the hand would be perfect, and after some experiementation I found just the right simple cable that stands up well from the rest of the fabric. 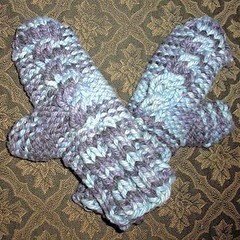 These mittens were made with the ribbing knit very long on smaller needles. I’ve got my fingers crossed that Jeffrey will get to see his first snow, so I needed mittens that will stand up to the most energetic snowball battle with his grandfather. 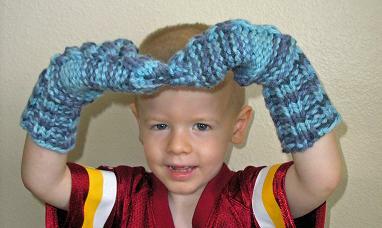 Here’s the pattern: Arctic Cable Mittens. Enjoy! 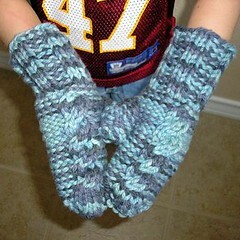 Queue the Arctic Cable Mittens on Ravelry!